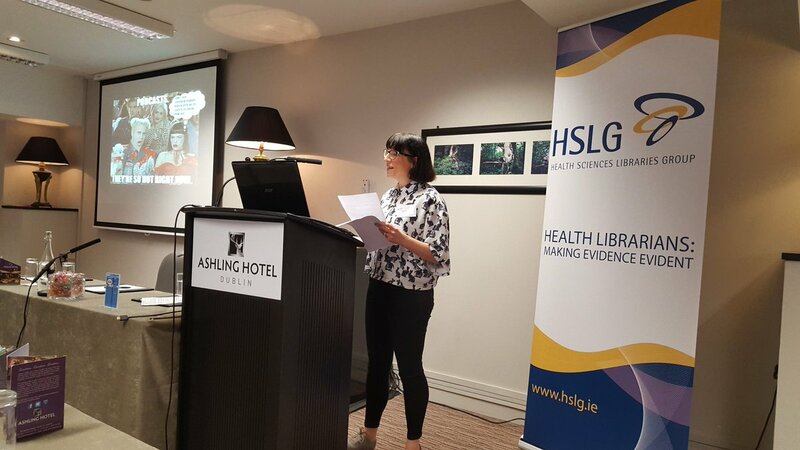 The HSLG committee would like to thank all who attended and presented at HSLG 2018. It was a great event and a perfect opportunity to share ideas and network with library colleagues. As promised we’ve uploaded the presentations for your perusal. Leading change: the experience of the Health Service Executive. Aoife Lawton & Sinead Roche Moore, HSE. Does The Health Librarian Have A Role To Play In The Development & Engagement With Graphic Medicine For End Users Health Literacy? Jane Burns, Irish Hospice Foundation & UCD. The Death of Expertise Anne Madden. St. Vincent’s University Hospital. A librarian is announced Mary Dunne and Mairea Nelson, Health Research Board. From Medical Shelves to Volcanoes and Elves: how the shelves of a medical library were transformed into a school library. Jean McMahon, Tallaght Hospital. Librarians Aloud’ a podcast record of changing librarian voices and values. Laura Rooney Ferris, HSE.